Work by James Florschutz facilitates a spatial conversation between nature and culture. Florschutz pairs industrial by-products with natural wood and stone, and rigid patterns with random arrangements, to fashion large-scale sculptures that are simultaneously attractive and formidable. Two pieces are currently on display in the lobby of Key Bank at 185 Main Street in Brattleboro. 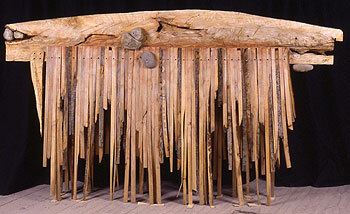 "Untitled Veil," a rustic yoke of cedar from which dangles a fringe of surveyors' stakes, resembles an icicle or stalactite formation -- motion commemorated in stillness. Untitled Veil is a fine sample of the artist's fascination with jaggedness and flow -- how a group of linear movements or shapes, when felicitously organized, become a wave. Florschutz makes no attempt to mask the means of construction. In fact, this piece foregrounds its own constructedness, with screw heads visible in the randomly affixed stones and in the wood. The row of perfect black circles and the long pencil mark used to place the screws comprise the only continuously straight line in the piece and invite the eye to consider the sculpture's relationship with the surrounding space -- particularly the space between the sculpture and the floor. While this "veil" might more readily have been mounted on a wall or suspended from a ceiling, the artist designed it to stand, improbably, on the longest of its spindly legs. Thus, while it takes a cascading form, the piece in fact works from the ground up -- a delightful paradox that adds to the mysterious nature of this curtained doorway. "Stratiform," with its hard lines, heavy granite base and slates stacked with unrelenting regularity, provides context for and contrast with Untitled Veil. Florschutz compares the piece to a core sample -- a vertical cross-section of soil, rock or ice that contains the geological history of a place. Viewed so far from its intended outdoor context, the five-foot-tall piece loses some of its impact, but one can imagine it jutting impressively up from the earth, the granite slab enhancing the suggestion of an obelisk. But that is merely a suggestion. While the layered slates may represent a kind of history, they are not a memorial. Like a furled wing, or the leaves of a closed book, the slates express potential. If we only wait, who knows what they might reveal? The artist will be available from 5:30 to 8 during Gallery Walk on April 6 at Key Bank. The exhibit continues through April. Notes from www.jamesflorschutz.com. : The sculptures of James Florschutz have been exhibited in solo and group exhibitions in galleries and museums as well as many universities and colleges throughout the United States. In addition, his work is in many private and corporate collections including Meditech Corporation and University of Western Alabama. He has received numerous awards and honors, including two fellowships from Vermont Studio Center. He has been awarded several private and public commissions; among them is Lead Artist for the Rutland County Courthouse through the Vermont Arts Council. Paula Melton is Gallery Walk's Assistant Editor and a free-lance publicity writer for the arts.